Model T Ford Forum: Christmas in Hollywood....a few decades ago. Christmas in Hollywood....a few decades ago. 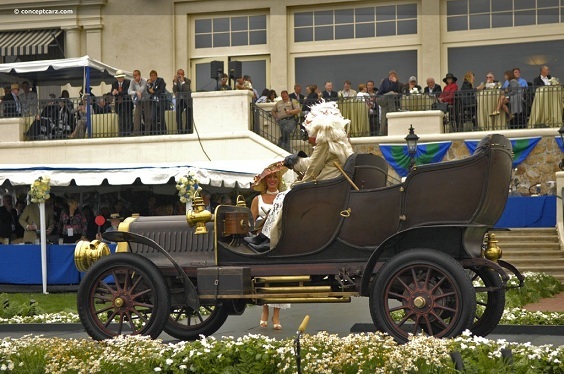 Model T Ford Forum: Forum 2012: Christmas in Hollywood....a few decades ago. Those doors don't look much like a Model T, but it's a cool photo. 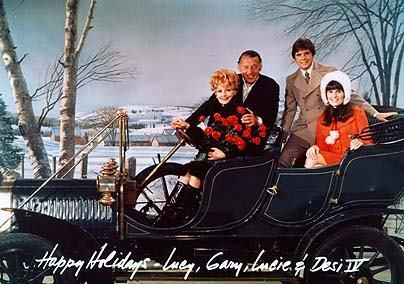 Lucille Ball and Jack Klugman...who are the two in the back seat? It's Lucy's second husband, Gary Morton. Correct me if the message on the bottom of the cars is not a dead giveaway! Lucille Ball, Gary Morton, Desi Arnaz Jr and Lucy - the last 2 being Lucille and Desi Arnaz children. So, what car is this? I'ld guess Cadillac just off the cuff, based on the shape of the doors. Weird curves. The door almost looks like an add-on with an arc all it's own. I'd say it's a 1906 Queen. That would be fitting for Lucy. Right down to the angle of the rear door handle.... I think Chris has nailed it.